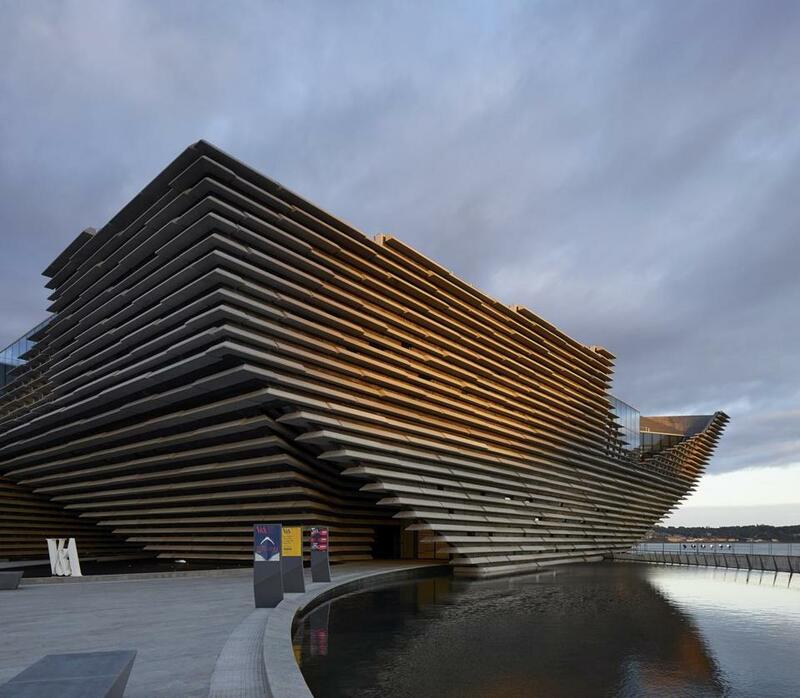 V&A Dundee, which opened last month, stands at the center of a $1.3 billion urban transformation of former docks in Dundee, Scotland. V&A Dundee, Scotland’s first design museum, stretches over the River Tay, its corner protruding like the bow of a boat. It also serves as the first outpost of London’s famed V&A, or Victoria and Albert Museum, the world’s largest museum of decorative arts and design. Inside, the Scottish Design Galleries display 300 items that showcase heritage and designs from across the country, taken from the V&A’s collections as well as pieces from private collections. The gallery’s centerpiece is the Oak Room, the rebuilt interior of a tearoom by Charles Rennie Mackintosh, a well-known Scottish architect, designer, and artist. The interior of the room, which had been in storage since 1971 when the building it was housed in was demolished, has been totally restored and reconstructed. Other highlights include the 15th-century “Playfair Book of Hours,” the oldest object in the Scottish Design Galleries, as well as newer items, such as a gown worn by Natalie Portman as Padmé Amidala in a scene from “Star Wars: Attack of the Clones.” The museum also contains a cafe and shop as well as a huge foyer. A terrace, accessed from the Scottish galleries and from the foyer, gives views across the river. Temporary exhibits will be shown along with the permanent collection. The museum’s opening exhibit, through Feb. 24, is “Ocean Liners: Speed and Style,” organized jointly by the V&A London and the Peabody Essex Museum in Salem, Mass. So if you missed the show last year in Salem, you have another chance to see it here, as well as the striking building it’s housed in. V&A Dundee, 1 Riverside Esplanade, Dundee, Scotland. www.vam.ac.uk/dundee, 44 1382 411611. Admission is free, though some special exhibits carry a separate charge. Open daily 10 a.m. to 5 p.m.